For Better - Or What? The Book! If you enjoyed this book, please consider leaving a review on Amazon. It doesn't have to be long; just a sentence or two and a rating are enough. These reviews really help. Thanks! "After 45 years of marriage, I didn't believe that I would get a lot of fresh insights about romantic love from a book. I was wrong. I learned a lot. And laughed a lot." Al Harberg, president, DP Directory, Inc.
"Insightful, witty, pragmatic, and heart-warming." Author of "The Woman with the Worm in Her Head"
"For Better - Or What?" is all about relationships - how good relationships work, and how to approach problems, disagreements and issues to resolve them in a positive way that will nurture the relationship and leave both parties better and stronger. Her section on how to avoid infidelity is especially good, with the most realistic, pointed and useful advice I've seen on the subject. 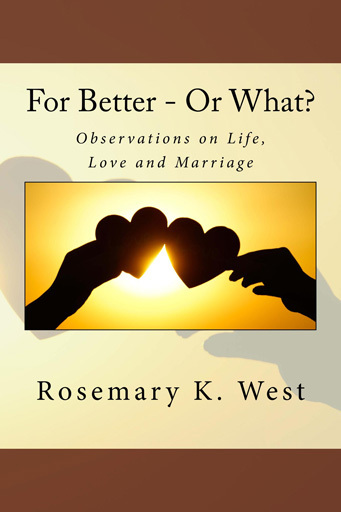 If you are looking to strengthen your current relationship, get tips on future relationships, or just want a good read, "Better - Or What?" is for you. Anyone in a great marriage will have a lot to recognize in "For Better - Or What?" Those who wish their marriage were better will find plenty of tips. For men it is a must-read, if only for the chapter that provides the "right" (and safe) answer to the dreaded, "Does this dress make me look fat?" Rosemary West provides an insightful, humorous, dignified and very human look at the best kind of marriage and what makes it work.